We have now officially moved to YouTube! All of our latest news coverage, movie reviews, editorials, interviews, and more can be found on our channel! Check it out and subscribe here! The story of the Hundred Acre Wood with Christopher Robin and Winnie the Pooh is timeless. In some form or another, everyone knows about the world of Winnie the Pooh, and that's why the marketing for Disney's Christopher Robin has been so interesting. It features Ewan McGregor (Moulin Rouge!) as a grown up Christopher Robin who has a wife (Hayley Atwell, Captain America: The First Avenger) and a daughter (Bronte Carmichael, The Darkest Hour). And when he becomes too focused on work and loses sight of what is truly important in life, Winnie the Pooh (Jim Cummings) then enters the fold. 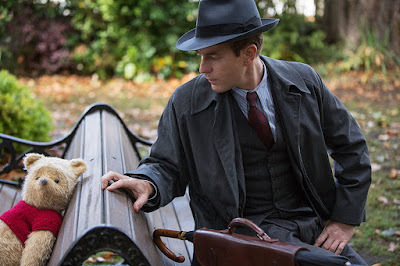 I think the trailers for Christopher Robin have been excellent. Not only have they played on nostalgia, but they've had so much heart and charm to them. 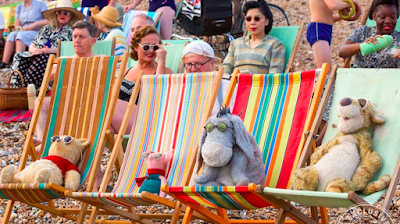 I never thought that a Winnie the Pooh movie would become one of my most anticipated films of the summer, but Christopher Robin sure did. So I went into the movie really excited for it, and Christopher Robin is a good movie. It's pretty paint-by-the-numbers in terms of its narrative--you can pretty much tell exactly how it's going to go just based off of the trailers--but Ewan McGregor gives a great performance, and the film has an abundance of heart and charm. A hallmark of Ewan McGregor's excellent performance is that it is easy to forget that for most of the movie he is acting off of nothing. For a majority of the film, he is interacting with and talking to CGI characters. Now, I don't know if they had stand-ins on set or whatever to play the role of the characters, but that doesn't change the fact that McGregor does not act off of human counterparts very often. And for his performance to be as good as it is, and for it to feel as tangible and natural as it does, it is a testament to how great of a job McGregor does. The blend of the animation with the real world is practically seamless. If you don't buy the animation of Winnie the Pooh and Tigger and Piglet and the whole gang, then the movie immediately falls apart. But thanks to Ewan McGregor's performance, and the great work the animators do, you 100% believe these CGI characters are right there with them in the real world. I would be remiss if I didn't praise the voice cast. Jim Cummings voices both Winnie the Pooh and Tigger, and he does an excellent job. I think it was imperative to get a classically trained voice actor for those roles instead of just a famous actor, and to have the original voice for those roles was great. With Eeyore and Owl and Rabbit and the other supporting characters, they got screen actors for the voices, and they did a fantastic job. Brad Garrett is perfect casting for Eeyore, and he damn near stole the show. Toby Jones and Peter Capaldi are also great as Owl and Rabbit, and their voices lend perfectly to these roles. Christopher Robin has excellent casting all around. Christopher Robin is incredibly predictable. Just from watching the trailers, you can probably tell me beat-by-beat exactly what happens in this movie, and you wouldn't be wrong. It is very paint-by-the-numbers. Now, that is not automatically a bad thing. A lot of movies can have very straightforward narratives and still be great because their focus isn't necessarily on giving us a wholly original and innovative story. And that is sort of the case with Christopher Robin. It's more important to director Marc Forster to establish Christopher Robin's relationship with Winnie the Pooh and all the other characters than it is to deliver on an innovative narrative. I wouldn't say the film is necessarily weaker for it, but some of the stakes are lessened when you can immediately figure out exactly how the movie is going to go. 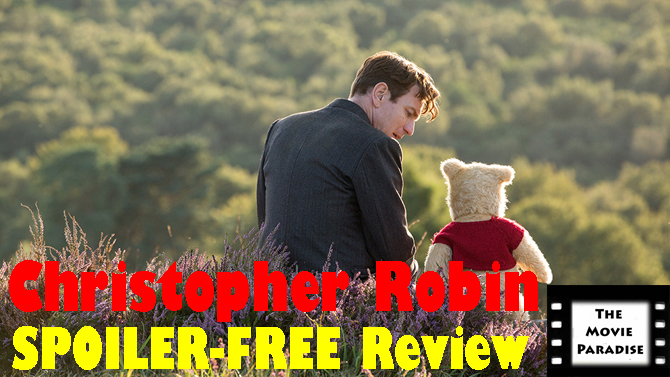 Overall, Christopher Robin is a fun and heartfelt adventure. Ewan McGregor turns in a really strong performance, especially when you consider that he is acting against nothing for most of the film. The characterizations of Winnie the Pooh, Tigger, Piglet, and the rest are great, with fantastic voice talents behind them. The animation is really well done, and it blends well with the live action. The story is pretty paint-by-the-numbers, and you can almost immediately tell exactly how it is going to go. But that doesn't impede on the movie's heart and charm. If you were looking forward to Christopher Robin, I think you are going to like it. What do you think? 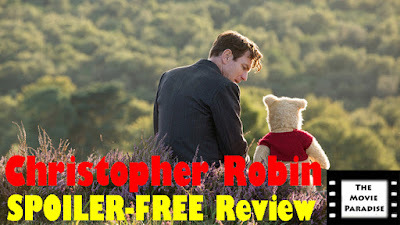 Have you seen Christopher Robin? If not, are you planning on seeing it? Leave your (spoiler-free) thoughts in the comments section below. Feel free to leave your thoughts. Just don't attack anyone, or spoil any films in theaters now. Thank you for visiting the page! Star Tom Hardy revealed that the reason why he chose to do Venom was because his son is a big fan of the character.